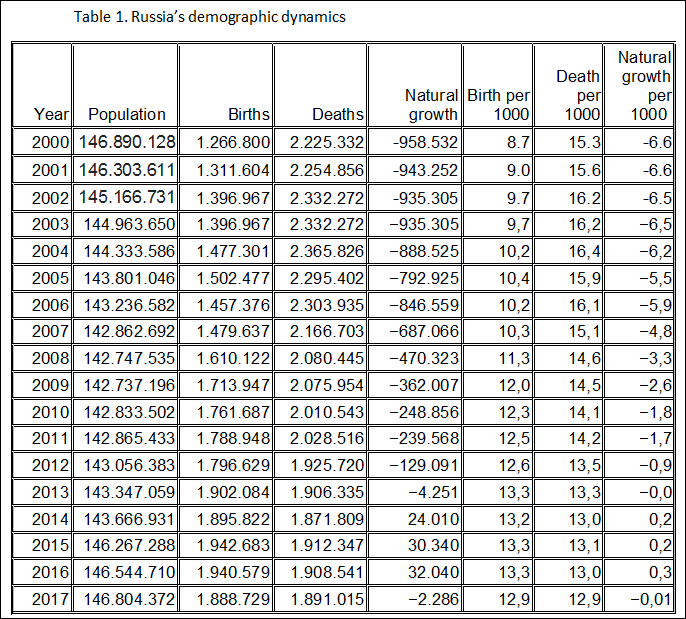 In the context of the general decline or close to zero increase of the population in Russia (see Table 1), there are few regions that demonstrate the opposite trend. Among these regions are the politically unstable republics of the North Caucasus: Chechnya, Ingushetia, and Dagestan. “You have so many children,” –commented a surprised European journalist, who visited Chechnya and stayed in one Chechen family for a night. “You know, it was war…, no electricity…, nothing to do…,” – a host answered jokingly. 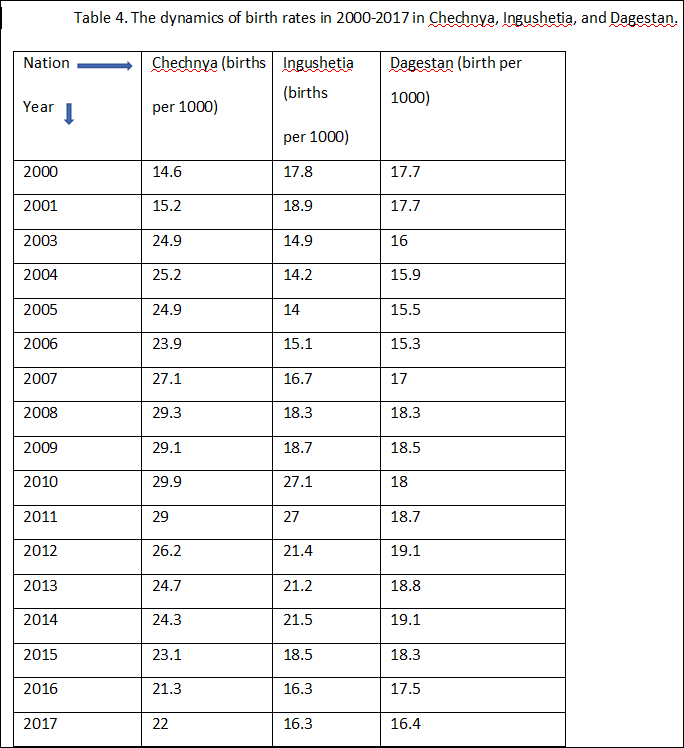 Indeed, three or more children per family is the norm in Chechnya, Ingushetia, and Dagestan. As the tables below demonstrate, these three North Caucasian republics are very close rivals in several demographic indicators. Among them are high birth rates, low death rates, and fast natural growth (which does not include migration). The latter factor causes usual concerns of the local administrations, which must ensure for the growing population enough nurseries, schools, playgrounds, stadiums, hospitals, workplaces, etc. Besides demographic growth, these republics also compete in terms of political instability. In the years of 2008-2010 the online media resource Caucasian Knot, which monitors the situation in the region, even recorded lower numbers of violence related death in Chechnya than in Ingushetia and Dagestan. This prompted analysts to speak about a spill over and spread of the Russo-Chechen war, which was becoming a new Caucasian War. However, in the beginning of the 2010s, Moscow-supported local governments managed to impose a tighter control over the territory and to bring down the violence. These tough policies resulted in emigration and turned the region into the main provider of fighters from Russia for ISIS. The instability, unfortunately, remained. A huge number of youngsters stayed home, augmenting the numbers of the dissatisfied with inability of the local governments to ensure employment or satisfactory quality of life. These numbers, due to the high birth rates, increase every year, which outlines another concern, this time directly related to the Federal government. From the Zhirinovky’s speech it could be understood that due to the legacy of the two Russo-Chechen wars of 1994-1996 and 1999-2009, there is a fear that Chechens, Ingush, and Dagestanis are preparing their children for a new war. 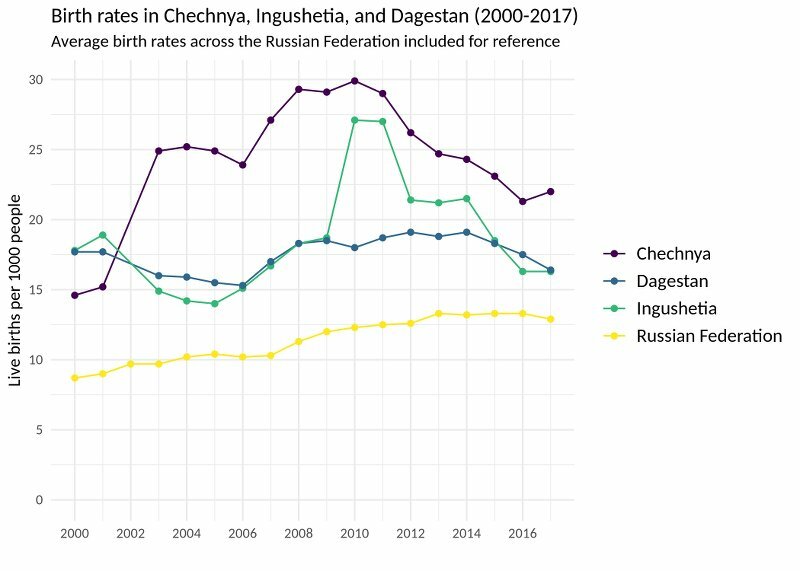 My research conducted with the Chechens in 2014-2017 targeted this concern by answering the questions: What are the main reasons of the Chechen high birth rates? Is Chechen population growth connected to the recent wars in the region? If yes, what kind of connection it is? 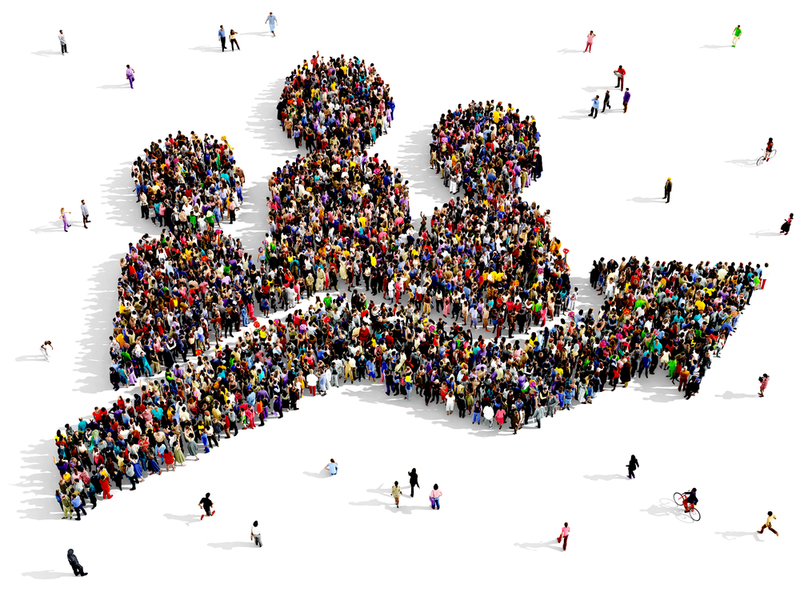 The research supported the idea that the link between demography and the existential threat indeed exists. However, “the preparation” for the next war for the Chechens means rather increasing a defensive capacity or the possibility of nation’s survival by strengthening the nation numerically. It was this reason that encouraged the Chechens to opt for larger families even during the war - opposite to what it could be anticipated. Indeed, the average birth rate during the harshest phase of the second war (see Table 2) remained similar to the pre-war situation. The declined intensity of the warfare immediately increased the birth rates almost twice. Indeed, other reasons were also mentioned by the Chechen males. The respondents usually enumerated several drivers for the procreation. Among these drivers the most frequently mentioned are: religion, traditions, economic reasons, and rural life style. The explanations provided can be summarised in a few sentences. Religion plays an important role, according to many interviewees. Islam (the main religion of Chechens and other North Caucasians), according to them, encourages procreation. God promises to give everyone what belongs to him and therefore you are not concerned much with finances. The respondents, who mentioned the role of traditions (the second biggest batch), would emphasise that large family for the North Caucasians means better chances in a probable clash for whatever reason. “If you have many sons – you have people to back you up,” – stated many respondents. Economic reasons were considered by fewer respondents. “The wealthier you are - the more children you can afford,” – was the general attitude of them. Not so many respondents mentioned the factor of the rural life style. Those who did, claimed that the rural setting favour larger families and that the North Caucasians are mostly rural settlers. Eventually, only few respondents mentioned a natural drive, as to say that people need to become a parent. It is important to note, that in the case analysed (the Chechens), all these reasons were a second choice that came after the necessity to survive as a nation. It is questionable if this finding be extended to the neighbouring Ingushetia and Dagestan. Their partial involvement into the violent confrontation with Russia suggests that it might be the case. Source: Russia’s State Statistics.Available online http://www.gks.ru/bgd/regl/b11_13/IssWWW.exe/Stg/d1/04-06.htm ; http://www.statdata.ru/russia Accessed on November 20, 2016. 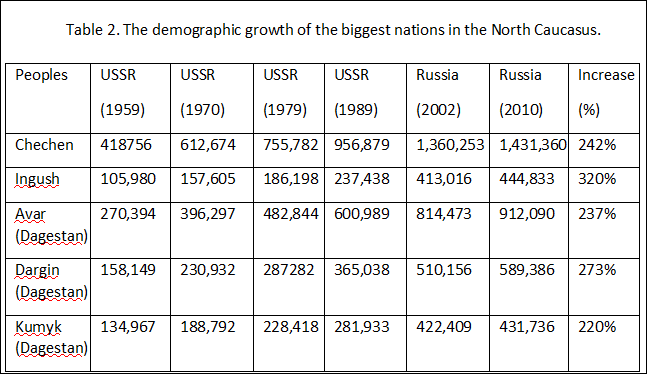 Sources: the USSR and Russia Censuses of 1959, 1970, 1979, 1989, 2002 and 2010. (The next census is supposed to be in 2020). Available online http://www.gks.ru/bgd/regl/b11_13/IssWWW.exe/Stg/d1/04-06.htm ; http://www.statdata.ru/russia Accessed on November 20, 2016. Source: Badoyeva et al. (2012), Surinov (2010: 76), Dianov 2015. See also state statistics available on http://www.statdata.ru/largest_regions_russia (last access 06/12/2018), http://russia.duck.consulting/maps/227/2017 (last access 18/12/18).